The ability to turn an array into a list of arguments is super handy with the Math functions. Let’s say you want to find the largest number using the Math.max() function. But rarely, would you pass in individual values. More likely, you would want to find the maximum element in an array. 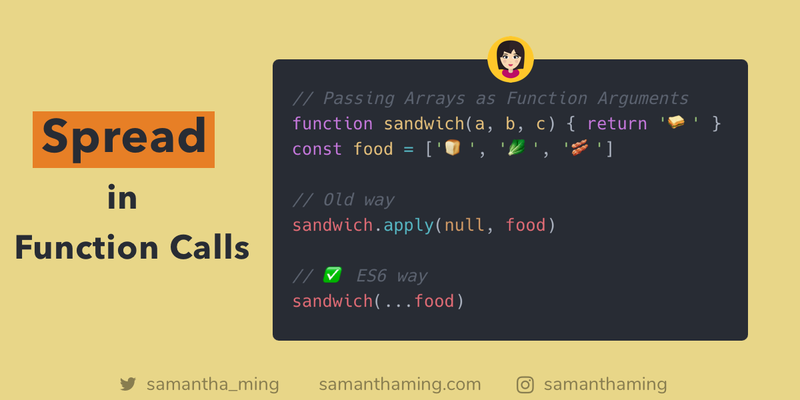 So the question now is, how do you pass an array of values into a function that accepts individual arguments and NOT an array? Lucky for us, we can use ES6’s Spread operator! What spread is doing here is taking the array element and expanding or unpacking it into a list of arguments for our variadic function. It unpacks (spread) the nested dolls into individual dolls. And now you have all these individual dolls (arguments) to place nicely in your display case (function). Another superpower spread has is combining arrays. What is a variadic function? So you may notice I use the term variadic functions. The computer science folks will have probably heard this term. But for the rest of the cool bees like myself 😝, it may not be so familiar. A variadic function is a function that accepts an infinite or variable number of arguments. And the Math.max() function is one of those variadic function.